An email that I received a few days back said Tulsi (also referred to as Holy Basil) helps to fight pollution and has a host of other benefits. Some months ago, there was a news item about the forest department wanting to plant a million tulsi saplings around the Taj Mahal to protect the world heritage monument from severe pollution surrounding it. 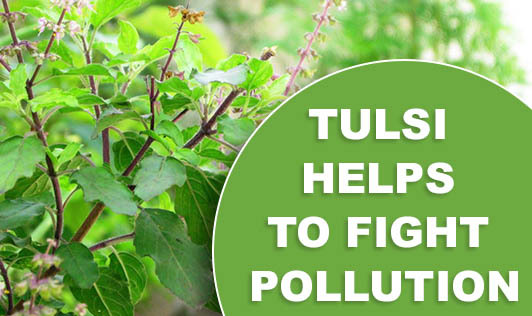 Tulsi is said to give out oxygen in large amounts and is therefore beneficial for the environment. Ayurveda extols the virtues of tulsi in health. Fights infectious diseases like tuberculosis and leprosy. May help to reduce blood sugar and cholesterol levels. Tulsi leaves can be brewed with tea. Tulsi juice can be taken with honey. Tulsi leaves or powder infusion can be consumed like a herbal tea. Enjoy the benefits of tulsi, but please consult a health professional if you have a problem, before trying out the tulsi remedies.